Back in 2013 I wrote about some of the videos that we had made specifically for schools. One of those videos was Weather on the Move with Francis Wilson. You can read about, and see, that video from the link above. In making such videos you always shoot more material than you are going to use. However, in this case we shot something that we could not use because of a technical fault. 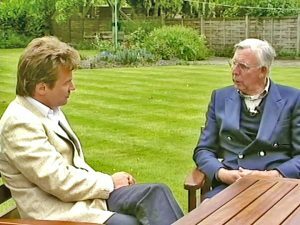 As part of the weather programme Francis Wilson wanted to interview TV’s legendary weather forecaster Jack Scott (1923-2008) We went to Jack’s home and as you will see, shot the interview very appropriately outside in his garden. All was well and that was it. However, when we tried to replay the video it was completely unstable on the colour lock. Most of the time it reverted to black and white. No matter what I tried, it would not playback in locked stable colour. So that part of the programme was dropped. That was still the case until about a year ago when I decided to try again. With a brand new playback machine it locked and ran first time in full stable colour. I committed it to DVD for safety, but alas it was far too late to ever be used for the purpose we intended. So, nearly 30 years later, here is Jack Scott in full colour talking to Francis Wilson. Fascinating. What a shame it didn’t reach the original programme. However, if it had been playable, it would no doubt have been cut down to a couple of minutes, which would have been a shame. As it happens, I quoted Francis Wilson’s formula for knowing how far away the horizon is just this week.